The Quad cherry trees have reached full bloom. The blossoms may hold for yet another weekend of good viewing. The trees are about 80 percent in bloom, and the petals are holding on despite the rainstorm this morning. This weekend will be good viewing for visitors. The trees are about 30 percent in bloom, and full bloom is expected midweek. 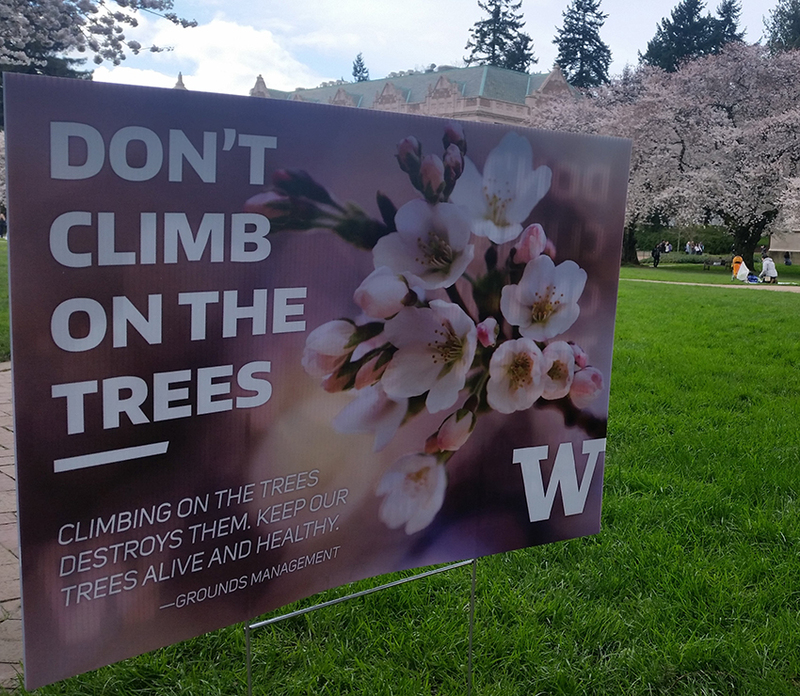 The blossoms should be in top form for visitors both this weekend and next, according to UW arborist Sara Shores. The trees likely will reach full bloom five to 10 days from now, after warmth and sunshine over the weekend boosted blossom development. 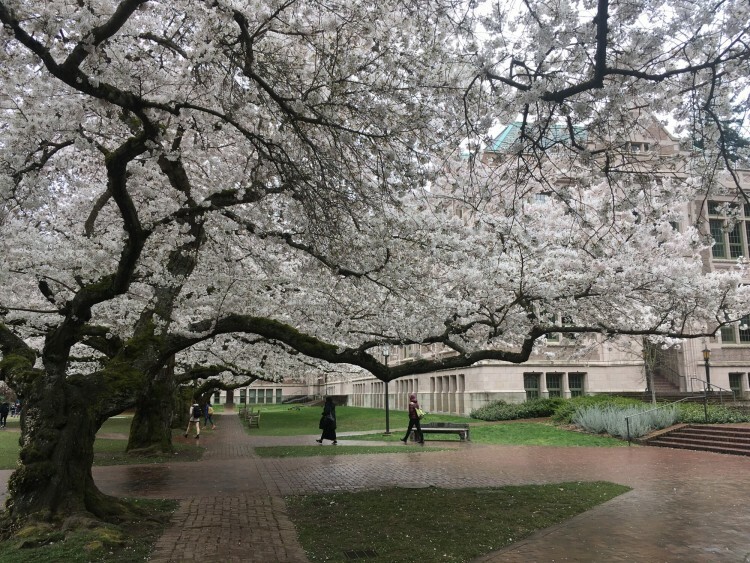 Only about 1 percent of the blossoms have actually emerged across the Quad, but the buds have advanced quickly over the last several days and the trees will near full bloom by the weekend. Continued cold temperatures and rain last week have kept the blossoms from emerging on the Quad trees, but the buds are starting to show signs of the upcoming bloom. It’s hard to tell with an untrained eye, but the buds are more rounded and fuller than before, and a green tip is visible at the top of each bud. Peak bloom typically happens 16 to 21 days after this stage, so if we get warm, sunny weather as predicted, peak bloom could still happen two weeks from now. That’s the week of March 19, which is UW’s spring break week. With snow falling in the Puget Sound region this week, it’s hard to imagine cherry trees in bloom. But assuming temperatures return to normal soon, this year’s cherry blossoms are on track for a typical season. 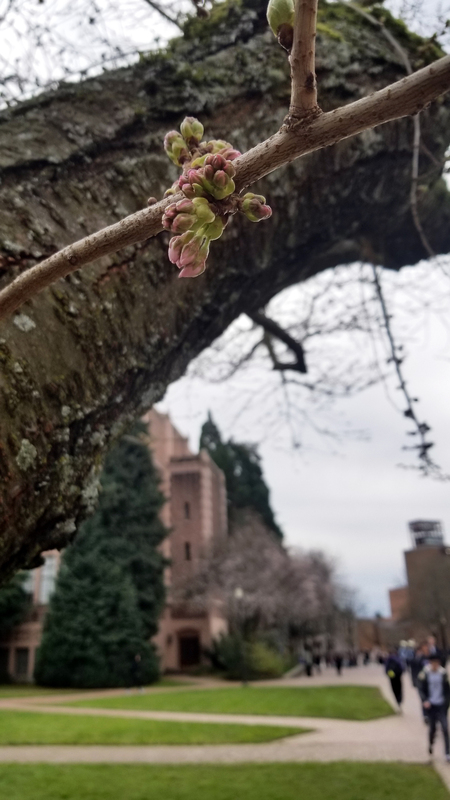 Blossoms on the iconic University of Washington Quad cherry trees will begin emerging soon, with full bloom expected the week of March 19, said UW arborist Sara Shores. Bloom timing varies each year and depends mostly on the amount of daylight and consistency of temperatures. If we have a stretch of days reaching over 50 degrees F, that bodes well for blooming. Alternatively, if it gets colder for a longer stretch, the blooming will stall. Last year, the trees in the Quad reached full bloom the week of March 26, within the typical timeframe. The two years before that, however, the blooms were early. The iconic Yoshino cherry trees in the Quad are nearly 90 years old and in good health for their age. The trees were first planted in the Washington Park Arboretum in 1936, and about 25 years later, they were moved to the UW Quad to make way for the Highway 520 bridge construction. 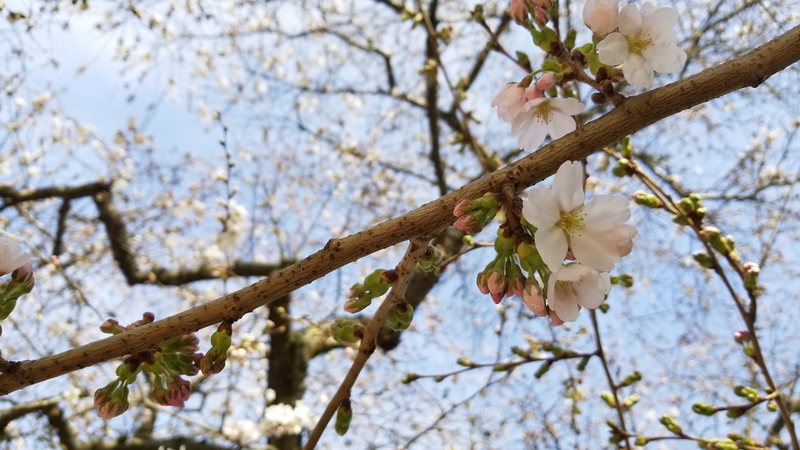 Arborists recently took cuttings of the Quad cherry trees and raised about a dozen genetically identical clones that are planted around campus and in the arboretum. 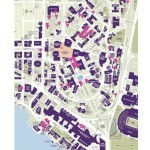 The biggest cluster is located on Parrington Lawn, just east of 15th Ave. NE at NE 42nd St. These trees should bloom at the same time as the Quad trees and represent the next generation of Yoshino cherry trees on campus. Across campus, there are more than 250 cherry trees of different varieties blooming at different times. Large trees near Gerberding Hall will flower several weeks after the Quad trees, and between Gerberding Hall and the Drumheller Fountain a group of young trees will also blossom a little later. 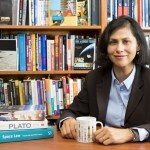 Plum trees, which look similar, typically bloom before the cherries. Visitors are asked to treat all of the trees with respect by not pulling on the blooming branches or climbing the tree limbs. The UW is raising money to help care for, and eventually replace, the aging Quad cherry trees. 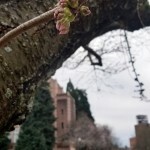 For the latest cherry tree updates, check UW News, follow @uwcherryblossom on Twitter or visit the UW’s Facebook page. 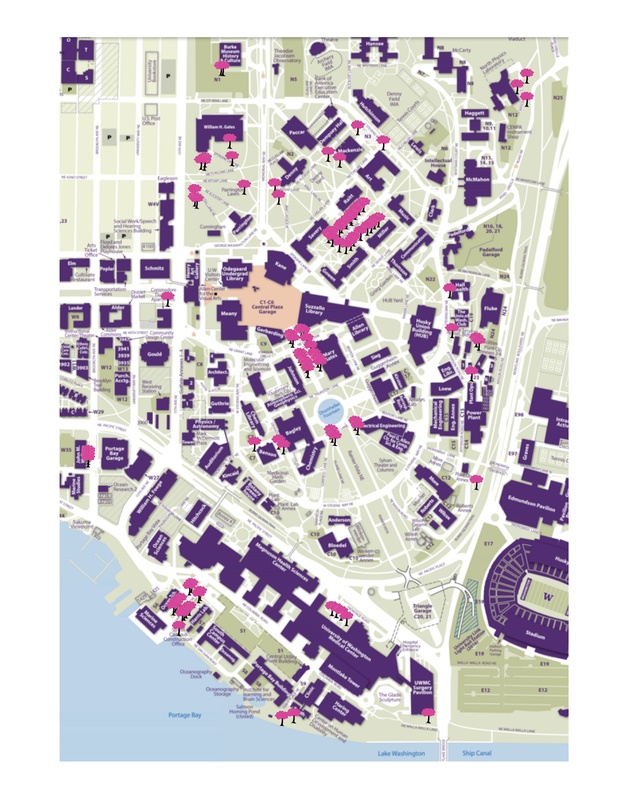 For information about visiting campus to see the blossoms, contact the UW Visitors Center at uwvic@uw.edu or 206-543-9198.